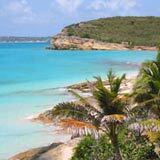 We covered Part 1 of Anguilla plumbing here. Now for Part 2. 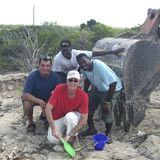 It's time to call back Mr. Vanterpool, our Anguilla plumber extraordinaire. We are ready to lay down the hot and cold water pipes. Unlike the drain and downspout pipes these pipes will constantly contain water that is under pressure. This is necessary to be able to deliver it throughout the house on demand. These (pressure pipes) are of a smaller diameter than drainage pipes. 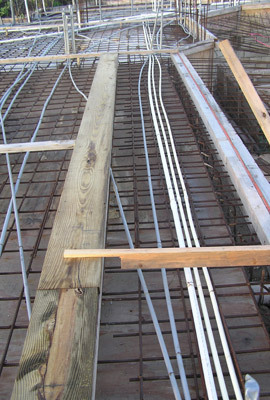 Therefore we are able to place them above the rebar meshing. Hot and cold water lines will start in the mechanical room and run to various parts of the house including Kitchen, Bathrooms, Laundry Room, gardening hose bibs and the like. 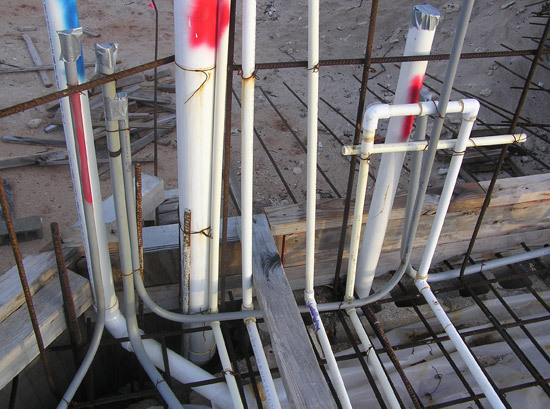 Once again, only PVC is used for the rough plumbing due to its durability in the Caribbean salty environment. 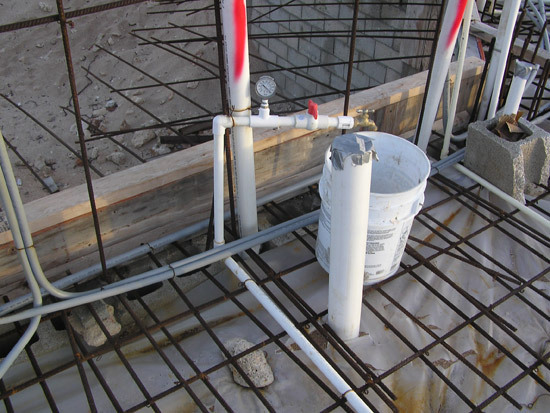 Although PVC is used throughout the system, the hot water lines require a special PVC called CPVC. Its color is yellowish rather than the common white of drain and cold water pipes. A special glue is also needed to connect the pipes to the fittings of CPVC. "Sinatra" (Mr. Vanterpool) says that if is not an all purpose PVC glue, you better make sure it's appropriate for CPVC. Because of the long runs of pipe between the different places that require hot water, we opted to use a recirculation system for the hot water. In essence what this does is constantly keep hot water in the pipes. The advantage of this is that you don't have to wait for hot water to make its way from the hot water tank to the tap because the water in the pipes cooled down. Most people just let the water run until it warms up but in these parts that can almost be considered sinful activity. Water is a scarce resource. Furthermore, it requires less energy to bring up the temperature from warm to hot rather than from cold to hot. 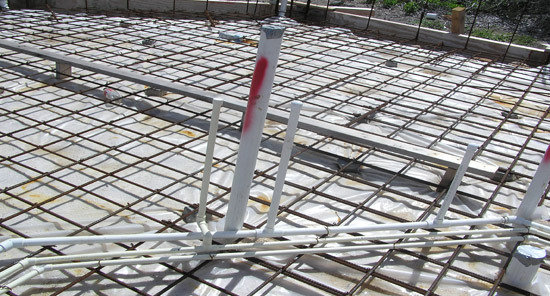 When we lay the pipes for the first floor we have to make allowances for the water runs that will be required for the second floor just as we did with the drains and downspouts. Once all the pipes are layout out, fitted and glued together, it is time to pressurize them and see if there are any leaks. This stage is very important because unlike lumber framed homes, the pipes will not be easily accessible if there is a problem. They will be encapsulated in concrete. "Sinatra" comes through with flying colors. The one leak that is detected is coming from a hairline crack in the line between the cistern and the water pump. This was a crack that probably happened somewhere between the manufacturing facility and delivery to our site. It would have been impossible to detect if the line was not pressurized. Sinatra cuts and replaces the defective pipe and re-pressurizes the lines. He is satisfied with what he sees, but will leave the system pressurized at over 100psi monitoring it over the next few days for any abnormal drop in pressure. What a pro. Next Step? Let's call the Anguilla Electrician... Freddie from Freddie's Electric!